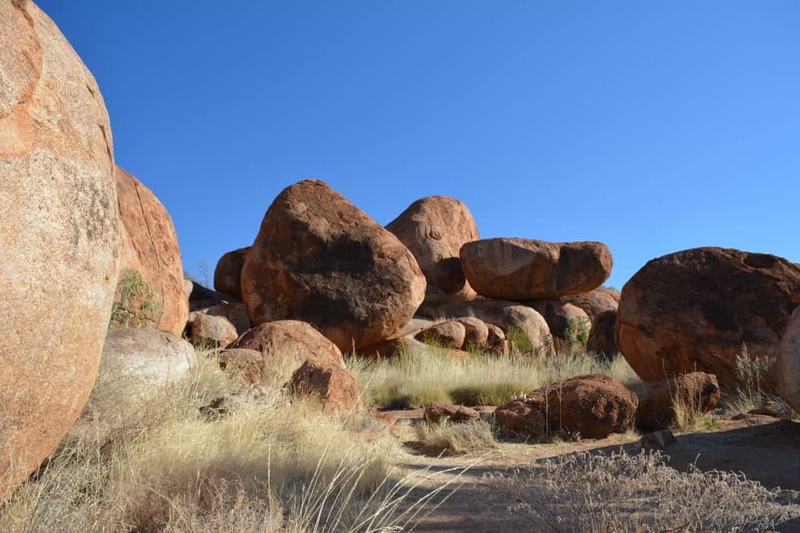 Karlu Karlu, these are great granite boulders that have been strewn across a flat valley, commonly known as the Devil’s Marbles. The name is quite unfair, suggesting that this place has been created by a hellish being, to trick the weary outback traveller or to give them the wrong impression of safety. 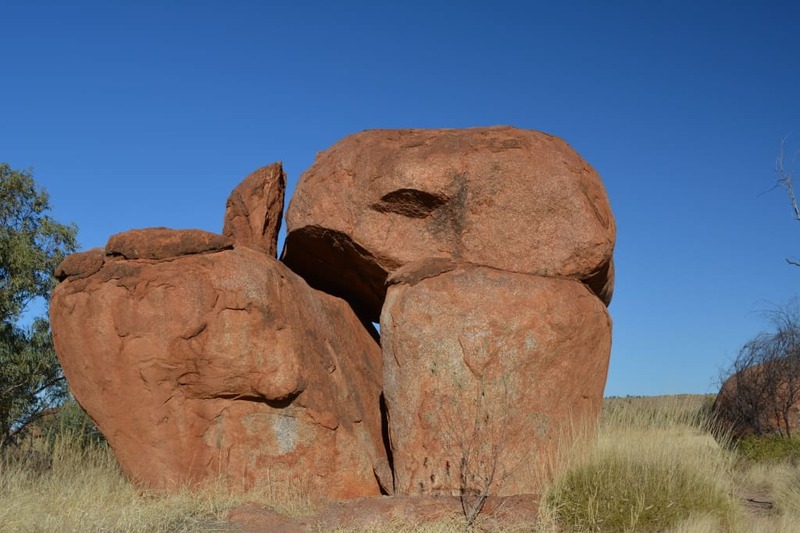 For the Aboriginal people who have cared for this land for many generations, the Devil’s Marbles are the setting for many Dreamtime stories, not all of them to be shared with the uninitiated public, but interestingly enough none of these stories involve the Rainbow Serpent and her eggs. There are however a number of mythological stories that date back to the days of creation. According to legend, Arrange, an ancestral figure, once made a hair-string belt, a traditional adornment. While making the belt, some hair fell to the ground in clusters and thus turned into the big red boulders. Arrange returned to his place of origin where he is said to still live today. It is very easy to reach the Devil’s Marbles once you are on the road. They are basically cut through by the Stuart Highway that is connecting Alice Springs with Tennant Creek. After a refreshing night in the UFO and alien capital of Australia, Wycliffe Well, we set off in the early morning hours. We have a lot of miles to cover today, with Tennant Creek only 100km away we need to make good speed to reach the Barkley Roadhouse which is pretty much in the middle of nothing at all. In other words, if we don’t make it to the roadhouse before sunset, we will be stuck in the dark desert with nowhere safe to stay. But first we need to discover the fascinating formations of the Marbles. These haphazardly arranged boulders are made of granite, eroded over time to remain in these marvellous rounded shapes that resemble balls, marbles or eggs. In fact, erosion still takes place, and can be observed in various stages all over the reserve. The site is not guarded when we get there. From the parking lot it’s an easy 15 minute self-guided walk around the main structures. Signs along the way explain the geologic phenomena and the cultural significance of the place. With the exception of another family we are alone. This place, even though located right next to the highway, is deserted and as remote as can be. We take our time strolling around the boulders. The kids love it. Every angle of the Marbles looks different – huge boulders seemingly defying gravity, dark shaded openings and caves in the maze of rocks, giant split boulders that look as if they had just come apart. We have a little bit of fun with the rocks, climbing one, taking photos with the other, but all the time acutely aware that snakes might like the shady environment just as much as us. If you want to stay here overnight you are very welcome. The camp site is basic, and you will need to ensure you have enough fuel, water and firewood. Your reward will be the view of these boulders and how they light up in bright reds in the warm glow of the evening sun or early in the morning. Since not many people will opt to camp in the desert without amenities, this is your place to discover the mystic of the desert in your very own pace. We have a long day ahead of us and hence cannot stay for much longer. After less than an hour we are on the road again, heading to dusty Tennant Creek which is around 100km away, for a lunch break.